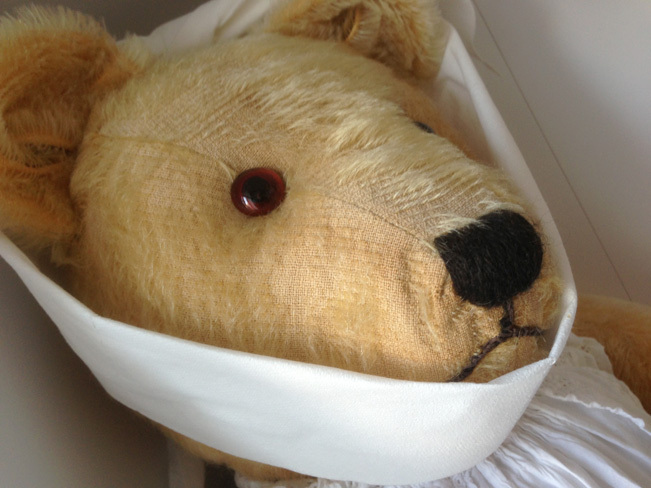 my old teddy bear | The tales of Henrietta, an extraordinary old bear! Click to follow Henrietta's tales and receive notifications of new posts by email. Henrietta moved along to the next stall where she had tried on her new dress and shoes. “But you don’t have any money, Henrietta,” said Pip. The lady looked at Henrietta and wondered what she could do to help Henrietta buy the shoes and dress. Henrietta smiled sweetly. Henrietta modelled all of the children’s clothes for the lady and the lady sold all of the clothing thanks to Henrietta’s help. No one had ever seen a bear modelling and smiling before and everyone gathered around in curiosity to look at Henrietta. “Oh yes Henrietta you are truly an extraordinary and very kind old bear”. My two old teeth have been with me a very long time. Mr Fox the woodland Dentist tried to force them out with his pliers but I gave him a black eye before running off, he’s a horrible fox but I enjoyed clamping my jaw down on his furry paw, boy did he squeal! He thought he was taking my last 2 teeth well he certainly had a surprise when he realised how strong and jagged they were.